This is a post summarizing a recent Preseem review by a WISP customer. For all reviews/ testimonials, click here. There’s something great above real unedited customer reviews. It just gains another level when one comes just hours after a deployment. That is, a happy customer reaching out to us and complimenting the impact Preseem had on their network and subscriber Quality of Experience (QoE). It’s even better when the customer records a video detailing the impact! The man of the moment is Casper Faust, Field Operations Manager at Paladin Wireless – a small Wireless Internet Service Provider (WISP) based out of Royston, Georgia. Paladin Wireless recently deployed Preseem’s QoE monitoring and optimization platform. Their aim was to get granular network insights and replace their traditional UBNT shaping with Preseem’s QoE optimized shaping. In his 2-minute video testimonial, Casper also talks about their engagement with Preseem before deployment and experience with on boarding team. He mentions how Preseem’s staff took care of setting their server, installing the operating system and Preseem. Importantly, he mentions how they, as a customer, had to do very little during this process. Furthermore, he compliments the interactions he had with our small team. He specifically appreciates the fact that he can always count on having a human voice at the other end every time he reaches out. Within 5 days of being in-line and generating network insights, Paladin Wireless took the decision to turn QoE-optimized shaping on. After that, Casper noticed the significant impact FQ-CoDel based shaping had on one of his subscriber’s experience. At 11.20 on the said day, Casper noticed that the latency for this selected customer dropped dramatically after Preseem’s shaping kicked in. Going into Thanksgiving weekend, Casper noticed that the improved experience was network-wide. Additionally, this saved him from the extra stress of expected incoming calls during peak holiday streaming periods. Above all, “My phones aren’t ringing” is how he best sums this up. This is a classic case of Preseem’s platform helping a WISP get detailed network insights as well as optimize their customer’s experience. Above all, happier customers lead to lower churn, reduced support costs and increased profitability. And this is what Preseem is all about! 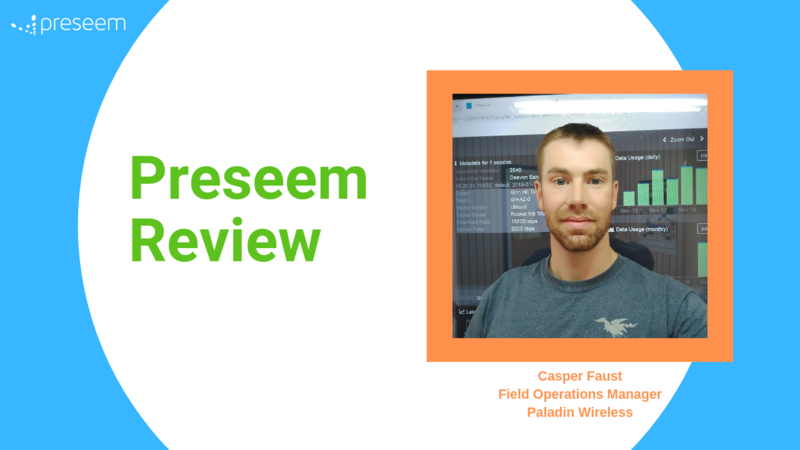 Just click on the video below to watch this Preseem review by Casper Faust, Field Operations Manager at Paladin Wireless. Click here to get in touch with us today for a free 30-day trial. If you’re already a customer, please help us by writing a Preseem review here.